I’d be lying if I said I didn’t get a chuckle out of it. The image of the mouse, Halwyn, “knitting” by tangling up a bunch of yarn, then tossing the whole thing into a fire… Totally cracks me up! Not that I’d ever do that. I’m one of those bizarre people who enjoys detangling yarn. 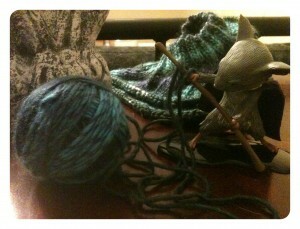 Admittedly, I prefer knitting, but when a skein barfs out a tangled mess, I just consider that a challenge. From there, of course, the players have a ball chatting about knitting in their MouseGuard community. Specifically about a mouse named Gurney who presses volunteers into knitting socks for the winter patrols. I know MouseGuard is fiction, but from a historical perspective, I found that idea fascinating. I’ve been researching Late Tsarist Russia for a novel, and everything I’ve found says that each family was responsible for making its own clothing. Growing, processing, spinning, and weaving flax. Sewing shirts and pants and dresses. Making shoes out of bast. Sure, they had contracts to sell some of what they made, but the impression I got was that for their own families, they had to make their own. The village didn’t have specific people who made clothing that others bartered for or bought. At least, not in the time period I’m researching. Which is actually later than the time period of MouseGuard (medieval). But, if you think about it, most of us don’t make our own clothes now. At some point, spinning, sewing, and knitting moved from a common household chore to a specialized skill. Something, like metalsmithing, that only certain people did, freeing up others in a community to pursue different occupations. Reading the exchange in Chad’s game makes me wonder if there were medieval villages that did this, that had specific people (other than wives, mothers, and daughters) who produced clothing for guards and the like, to free them up to protect the village. And, if not, at what point did that happen? Was it during the industrialization of Europe, or did it first shift to a cottage industry? Do you knit to relax? Or know about the evolution of knitting? Post your thoughts below! I’d love to hear what you think! Tagged Games, History, Knitting, MouseGuard, not really sure that's knitting, RPGs, Things that Fascinate Me, Yarn. Bookmark the permalink.